Q & A: Which Foods Prevent These Deficiencies? Home > Fun & Quizzes > Q & A: Which Foods Prevent These Deficiencies? 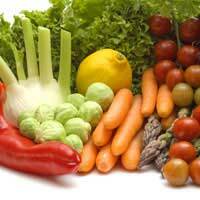 Lack of certain foods can cause deficiencies in vitamins, and these cause diseases. Vitamin deficiencies are most common in areas where people are malnourished because of famine, but some people on restricted diets do have to be careful about deficiencies. Beriberi is caused by a lack of thiamine (vitamin B1). Symptoms include tiredness, weakness and weight loss, with an irregular heart rate and other heart problems. It is common in areas hit by famine. Question 1: Which foods will prevent beriberi? Question 2:Which foods will prevent pellagra? Scurvy is caused by a lack of vitamin C. Symptoms include pale skin with spots, bleeding, soft gums, and bleeding from other mucous membranes. Scurvy used to be common in sailors, because they didn’t eat much fresh food. Question 3: Which foods will prevent scurvy? Answer: Foods rich in vitamin C will prevent scurvy – these include fruit and vegetables, and liver. Rose hips, blackcurrants and red peppers are particularly high in vitamin C.
Rickets is caused by a lack of vitamin D, which helps the body use calcium to form strong teeth and bones. People with rickets will have soft bones which can become bent and break easily. Rickets is most common in people who don’t get enough sunlight, or who are malnourished. Question 4: Which foods will prevent rickets? Regular exposure to the sun will also prevent rickets, as the skin makes its own vitamin D.
Lack of vitamin A is one of the causes of xerophthalmia. This makes the surface of the eye very dry, and can lead to blindness. It is most common in developing countries where the diet is limited. Question 5: Which foods will prevent xerophthalmia? Megaloblastic anaemia is caused by a deficiency of vitamin B9 (folic acid) and/or vitamin B12 (cobalamin). This means that red blood cells do not form properly. Question 6: Which foods will prevent megaloblastic anaemia, and who is most likely to have problems with a lack of vitamin B12? It is particularly hard for vegans to get enough vitamin B12. Vegans can get some vitamin B complex from yeast and yeast extract and fortified foods or should take vegan-friendly supplements. Blood clotting problems can be caused by a deficiency in vitamin K. A deficiency in vitamin K is rare in healthy adults, but does sometimes occur in newborn babies. Question 7: Which foods will prevent a vitamin K deficiency? Vitamin K is also made by the friendly bacteria in the gut. Newborn babies don’t have these bacteria, so have an injection of vitamin K at birth. Which Foods Provide These Vitamins? This information above helped me a lot when I was struggling with my Ancillary health care assignment. Thanks???? Excellent! Awesome & useful advice! Thankyou! I wish I get more advice like this!